On Stack Overflow and our other code-related sites, creating a minimal, complete, and verifiable example is the best way to get an answer to your question. We’ve always loved JSFiddle and sites like it because they let both askers and answerers reference runnable, working code that demonstrates their problem or solution. If the link breaks, the post becomes worthless. If the code isn’t embedded in the page, visitors are forced to go elsewhere to get the full content of the question or answer. Also, because the code isn’t a part of our post Markdown, changes to it don’t show up in the revision history. The community voiced similar concerns around external sites, which eventually led us to block posts that contain links to JSFiddle and similar sites without a corresponding code block. This is an unnecessary burden for both askers and answerers. How Do Stack Snippets Work? Stack Snippets work for both questions and answers. In the Markdown editor window, there’s a new button that you can click to launch the Stack Snippets editor. When answering a post containing a snippet, you can easily include a modified version of the original in your answer – just click the “Copy snippet to answer” button. This makes them instantly backwards-compatible with our normal revision history and diffs, and also any API clients including our own mobile apps. 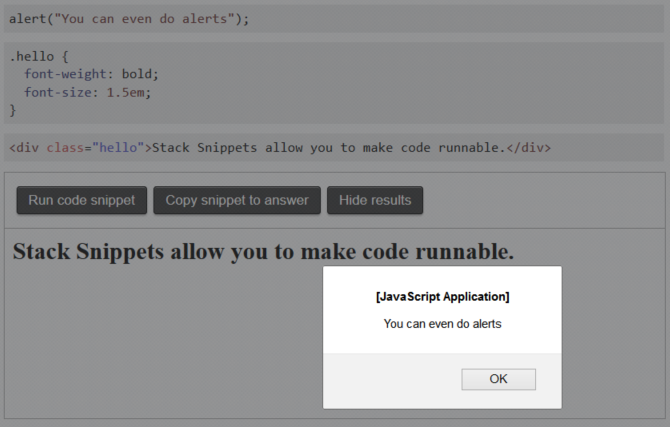 The runnable snippets behavior is triggered by a few new HTML comments that are not rendered by Markdown. 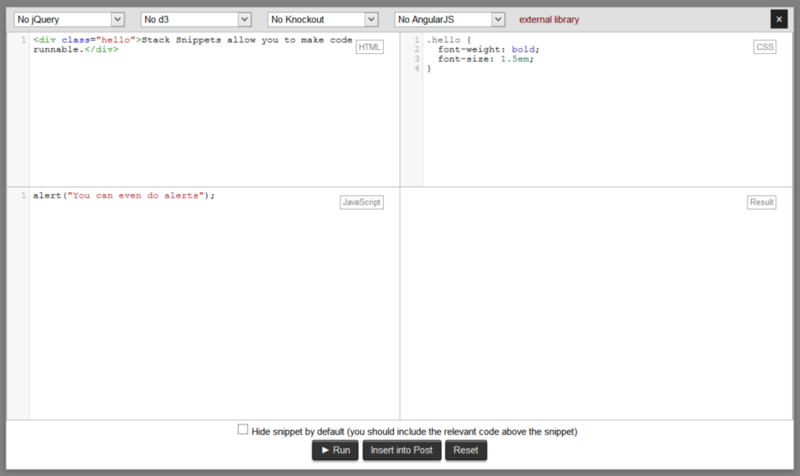 You can even edit the code right from the Markdown editor and the snippet will still be runnable. We use HTML5 sandboxed iframes in order to prevent many forms of malicious attack. We render the Snippets on an external domain (stacksnippets.net) in order to ensure that the same-origin policy is not in effect and to keep the snippets from accessing your logged-in session or cookies. Like all other aspects of our site, Stack Snippets are ultimately governed by the community. Because users can still write code that creates annoying behaviors like infinite loops or pop-ups, we disable snippets on any post that is heavily downvoted (scoring less than -3 on Stack Overflow, -8 on Meta). If you see bad code that you think should be disabled, downvote the post. If you see code that is intended to be harmful (such as an attempt at phishing), you should flag it for moderator attention. What About Sites Like JSFiddle? You can still use sites like JSFiddle if you prefer them. 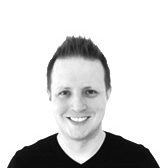 JSFiddle and similar sites still have a bunch of features that we have not implemented yet. The normal rules for a link still apply: make sure you copy the relevant code into your question or answer so that it can be accessed if the external site is unavailable. There’s no need to copy-paste the code into the post. It’s all embedded in the post automatically, so revision history and diffs just work. There’s no need to visit another site to get your answer. The best experience is one where your question and answer(s) are complete and on the same page. Since we host it, we can guarantee performance and up-time. We have high standards when it comes to performance and up-time, and want to make sure that the ability to run a snippet is always available. If you find bugs, or you’d like to give specific feedback on Stack Snippets, you can post on Meta Stack Exchange using the tag stack-snippets. If you just want to try it out, we’ve created a sandbox on Meta Stack Exchange. If you feel that a particular site should have Stack Snippets, post a feature-request on that site’s meta – if there’s support from the community there, we’ll enable them. We’ve already started piloting it on Code Review and are seeing some neat results. Don’t hesitate to share interesting examples you come across – or create – here in the comments. Is there a way to avoid the Run Snippet button and just show? I’ve written a script to take the output from Terminal in OS X and produce a neat bordered list. You copy the terminal output to the clipboard, run my script and it pastes the snippet exactly as you do them back into the clipboard for pasting into post. Output doesn’t look right in a code block or raw so either there should be an output feature or rely on this sort of mechanism. Its just CSS and HTML.